Bonsai (from Japanese 'tray planting') is a Japanese art form using cultivation techniques to produce small trees in containers that mimic the shape and scale of full size trees. Similar practices exist in other cultures, including the Chinese tradition of penzai (potted plant) or penjing (art of depicting artistically formed trees, other plants), from which the art originated, and the art of making miniature living landscapes, imitating the scenery of the islands, mountains and surrounding environment as found in nature, in Vietnamese Hòn Non Bộ. The Japanese tradition dates back over a thousand years. 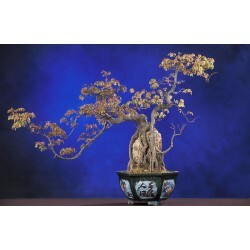 Ultra lightweight bonsai shears for the very accurate shaping and pruning of your bonsai. The program ranges from pruning shears with traditional large handles and short pointy blades to narrow scissors with long blades for precision pruning. Okatsune 200 are traditional Japanese bonsai scissors suitable for highly accurate forming and maint..
Okatsune 201 are traditional Japanese bonsai scissors suitable for highly accurate forming and maint..
Okatsune 203 are traditional Japanese bonsai scissors suitable for highly accurate forming and maint.. If you like Bonsai, you'll find these bonsai scissors Okatsune great. The 220 mm long, ultralight sc..